What do Swedish supergroup Abba, the Nigerian central bank and UK economist Andy Haldane have in common? All three are helping to speed the demise of cash. The news that banknote printer De La Rue is shuttering a quarter of its capacity amid a global note glut adds to a sense hard currency is in decline. Yet a cashless society is still some way off. The shutdown of Malta-based printing presses by the world’s biggest producer of commercial banknotes announced on Dec. 2 may be driven by commercial rather than conceptual changes. Bank-note printing suffers from huge overcapacity. It’s not that people want to hold fewer notes, but that paper currency is being replaced by more modern polymer versions. Still, the push away from cash is building. Ireland in October encouraged shops to round up rather than give small change. The Abba museum in Stockholm only takes cards and electronic payments, because cash facilitates crimes “from murder to bicycle theft.” Sweden broadly agrees. The nominal amount of currency outstanding has contracted by more than a quarter since early 2010. Central banks have good reason to speed the transition. Bank of England economics tsar Haldane has lamented the “zero lower bound” syndrome that means policymakers cannot easily impose negative interest rates on bank reserves without savers simply switching into cash. While that’s largely theoretical for now, the Bank is reviewing alternatives like digital currency. The most persuasive case against cash is that it helps money launderers. In the UK, a 2010 study by the National Crime Agency found 90 percent of all 500 euro note usage was by criminals. Nigeria said in 2012 it would start to move towards a cashless society. The real value of naira in circulation fell by 3 percent in September, year-on-year. Yet rich countries like Sweden and very corrupt ones like Nigeria may be the outliers. In most countries, supply of currency is growing stubbornly. In the United Kingdom, the current annual increase of 6 percent in nominal terms is in line with the average since 1970. While digital alternatives will logically gain ground, the privacy, data protection and trust issues are incalculable. Cash may seem like an anachronism, but it is far from facing its Waterloo. 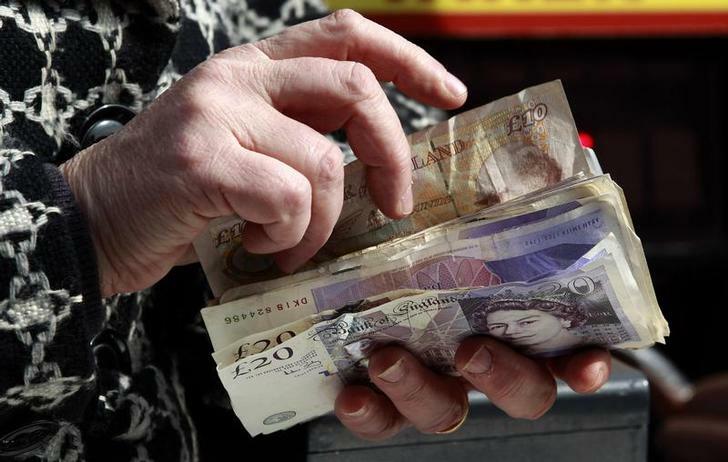 A person is seen holding money in Gloucestershire, western England March 15, 2011. De La Rue said on Dec. 2 it would cut its production of bank notes by a quarter as part of a five-year plan to tidy up its manufacturing. The company, which is the world’s biggest manufacturer of commercial bank notes, said it would shutter money-printing operations in Malta, though still use the island as a base for making passports and identity products. While De La Rue has said that it expects banknote volumes to keep rising, and its own output grew by 5 percent in 2014, it has previously warned of high levels of overcapacity and competition in the banknote paper market. The Bank of Ireland announced in October that retailers would be able to round change to the nearest 5 cents from Oct. 28, following similar policies in Belgium, Denmark, Finland, Hungary, the Netherlands and Sweden. Consumers would be free to ask for their exact change. The Bank explained that minting a 1 cent coin costs 1.65 cents. Andy Haldane, the Bank of England’s chief economist, said in a speech in September that the central bank was reviewing the role of digital currencies, in light of the “pressing demands” of the zero lower bound. That refers to the theory that if central banks were to set negative interest rates on bank reserves, users of money would switch into cash, undermining the effectiveness of monetary policy. Denmark’s centre-left government proposed in May to scrap the obligation of retailers to accept cash payments from 2016. The government was replaced after a general election in June.